There’s no doubt that wrought iron fencing is an investment to last a lifetime. Just look at all the ways wrought iron has been used throughout history, with many antique pieces still standing strong today! Well-renowned for its durability, wrought iron has the added benefit of its remarkable and unique beauty. Adding a stately elegance, iron fencing is unrivalled in its ability to create that breathtaking first impression of any home. As with all types of fencing, iron does need some regular fence maintenance to protect it from the elements and maintain its appearance. By following our simple fence maintenance tips, your investment will be as solid as the iron it is made from! The main thing you need to protect your iron fence from is rust. It’s not just those who live in tropical climates and humidity who need to be vigilant for this pesky invader; it can make itself known come rain, hail or shine. Nothing can spoil the beauty and grandeur of iron fencing quite like out-of-control rust, which is why it’s so important to stay on top of it from the beginning. As with most things, prevention is better than cure. What starts off as a tiny spot can quickly become a bigger problem if not nipped in the bud. Save yourself the headache and expense of prolonged rust exposure with simple fence maintenance. Protecting your fence is as easy as applying rust protective wax on a regular basis, to help form a barrier against the elements. Alternatively, a coat of paint will have a similar protective effect, while also revitalising your fence with a fresh colour and shine. If you are experiencing particularly wet weather conditions, a tarp covering could also be used as a temporary protective measure. In addition to a protective barrier, it is essential that you give your fence a regular clean as often as possible. Dirt, dust, grime and other debris build up on fences over time, which can cause damage (and hide existing damage that needs your attention). To clean your iron fence, take a bucket of warm water mixed with a gentle cleaning solution (dishwashing liquid is fine) and use a fine wire brush to gently lift dirt off the surface. Keep a toothbrush handy to get into the hard-to-reach areas to ensure a thorough clean. After cleaning, give your fence a rinse and then dry if off with a cloth—prolonged water exposure should always be avoided. When you’re cleaning your fence, it’s a great opportunity to give it a once-over and look for anything that needs addressing. In addition to rust spots, keep an eye out for damage, dints, cracks, loose or unstable areas or anything else out of the ordinary. The surface of the iron should be smooth and even, and the paintwork should be free of any lumpiness. If your iron fence is showing any signs of deterioration, it is important that you act promptly as the problem will likely worsen without treatment. Help! I found rust … now what? If your iron fence has already fallen prey to rust, don’t panic. Depending on the extent of damage, you may be able to treat it yourself at home. Minor spots of rust are common, and are usually easily fixed … if caught in the early stages. You can remove small spots of rust by gently rubbing them with a fine wire brush, or a square of sandpaper. Be careful not to use anything overly abrasive as you will risk causing further damage by inflicting scratches to the iron (or removing the paint). For more stubborn patches, you can invest in a rust converter. A water-based primer, rust converter works by converting rust into iron tannate, a stable protective barrier. It is a good idea to apply rust converter as a regular part of your fence maintenance plan, at the first signs of rust. If you have more extensive damage to your fence, it may be time to call in the pros. Contact an expert wrought iron fencing professional for advice on how to salvage your iron fence if it has seen better days. • Iron is an extremely strong and durable choice for your fence or gate. • Provided you follow simple fence maintenance tips, you can expect your iron fence to last many decades. • Protect from the elements and humidity by applying rust protective wax or a fresh coat of paint. • Regular cleaning will help prevent damage, and help you find existing damage. • A fine wire brush, and warm water mixed with detergent is all you need to give your fence a weekly clean. Upon completion, wipe away any residue and dry your fence with a dry cloth. • Small patches of rust can be removed by gently rubbing them with a fine wire brush (being careful not to scratch or damage the paint). • Rust converter should be utilised regularly at the first sign of rust, to form a protective barrier. • Extensive, widespread rust to your iron fence can be avoided with regular fence maintenance. In the event that your iron fence has fallen into disrepair, contact a professional to find out your repair options. Iron fences and gates make a fabulous addition to any home. They have an unrivalled lifespan and are heralded for their durability. Adding value to your home, every property could benefit from the addition of wrought iron fencing! With easy upkeep as an added benefit, all you need to do is follow our simple fence maintenance tips to ensure your fence will maintain its majestic appearance for the long haul—and save you costly repairs down the track. For more information on wrought iron fences, contact Dean Wilson Iron on (07) 3814 0076. 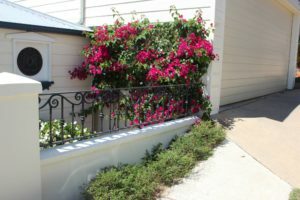 The expert team are the premier wrought iron craftsmen of South East Queensland, and are happy to discuss your ideas and help make your dream fence become a reality! With an impressive portfolio of some of Brisbane’s most iconic iron designs, we can custom design your fence to suit your needs.